Do you live near a Hanna Andersson store? 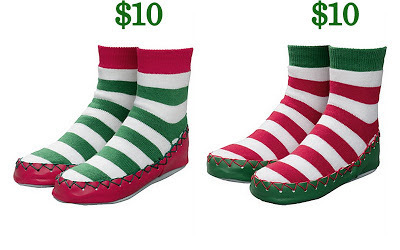 If you do, these little striped slipper moccasins for babies and kids are just $10 (normally $22). The bottom is leather, but they are machine washable! These moccasins are warm and soft and perfect for Christmas vacation. I can also attest to the fact that, when worn with a decent pair of socks, these even stay on squirmy baby feet pretty well. And if the stripes are not your thing, they are also available in great solid colors for $10. Sizes are limited, but it is very much worth a try. The reason I asked if you live near a Hanna Andersson store is because you now have to pay for expedited shipping to get your items delivered by Christmas from their website, so it would definitely be more economical to buy them in a store without the delivery charge at this point. And while at the store, don't miss out on the winter pilot cap sale... some colors are half off at just $12! These are my favorite hats, and they have sizes for newborns through 5 or 6 year-olds. These ensure that small ears stay covered, and they work great under coat hoods as an extra layer. That gray, called "cobblestone", is just perfect. The Swedish moccasins and the pilot caps fit nicely into Christmas stockings! Just wanted to give you and your readers a head's up that Bella Bliss Clothing is having a flash sale today with items allow as $10 and free shipping on orders over $75! Kids Blundstones are $39.50 at JCrew today! Limited sizes! Wow! Thanks, Robin. I just posted this (hope you don't mind that I mentioned you) The good news is that with the additional 30% off available today, they are just $27.65. Awesome. Hope you are all well!